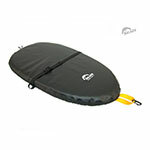 The Danuu Dude Kayak Cover is perfect for recreational, sit-on-top and touring kayaks ranging in size from 14' to 16'. Prolonged sun exposure can damage just about anything - especially your kayak. If you can't keep your kayak inside, the best way to protect your boat from the sun's plastic ruining UV rays is, without a doubt, a kayak cover from Danuu. 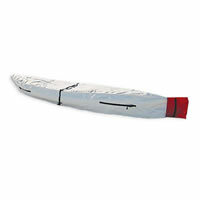 Danuu Kayak and Canoe Covers are a must have accessory that offers hassle-free kayak protection. Constructed from water and UV resistant nylon ripstop, Danuu Covers are double stitched and reinforced with a double layer of material at each end. The unique fitting system allows you to just drop the cover on, tighten up the 4 to 6 straps (depending on size) and you're ready to go. Best of all there is no more hunting for a red flag for the end of your boat - after unfolding the cover turn the stuff bag inside out and it becomes your red flag! Danuu covers also have reinforced air holes so the bag won't catch the wind while driving. 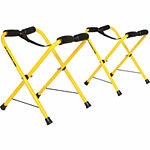 Danuu covers are available in ten sizes to fit 9' - 26' boats. Brat - Small kayaks 9' - 12'6"
Skipper - Canoes & small dinghies 11' - 14'6"
Ranger - Canoes 14' - 16'8"
Scout - Canoes 16' - 18'6"